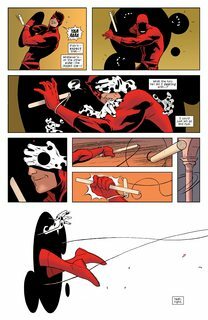 Daredevil by Mark Waid Vol. 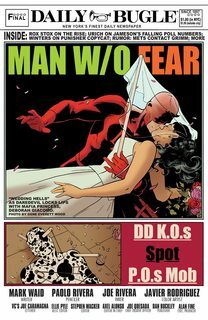 1 – 7 (2012-2013) : With new enemies, new friends and that same old “grinnin’ in the face of hell” attitude, the Man Without Fear is back in action and leading with his face! Mark Waid (AMAZING SPIDER-MAN, Irredeemable, RUSE) joins neo-legendary artists Paolo Rivera and Marcos Martin for a new spin on Daredevil that will leave you gasping for air. Having turned his world upside down during the past several years, Matt Murdock realizes justice may not be blind to his past and villains may not be the only ones looking for answers. Bring it on! 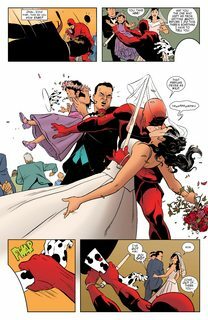 If Matt Murdock could see what he was doing, he’d be terrified.